Can you post / email me screenshots of the messages? and here is the text it has in the text box. Was that helpful at all? Do you need more of these posted? I assume they all say the same thing, but I could be wrong. If you need more posted for a larger sample I can post more. We don't need more screenshots but I can use a couple more of the exception texts and compare them. I don't have an update on this specific bug but our developers have been working on some internal betas. I think we're closer to releasing another update (within 2 weeks, hopefully sooner). I'll ask about the status of this bug specifically. You see the error randomly? When launching other programs? When launching TMS? You can try updating / reinstalling your .NET framework, but I'm not sure if that will fix it. We haven't heard of other users with those exceptions yet. Added fan hysteresis for auto mode. Added °C/°F and LPM/GPM unit toggle. Added right-click menu option to front window graph. Increased name length of temperature sensors, fans, and flow meters. Changed default log folder to local user \documents\tms-205. Fixed several COM connection and software crashing issues. 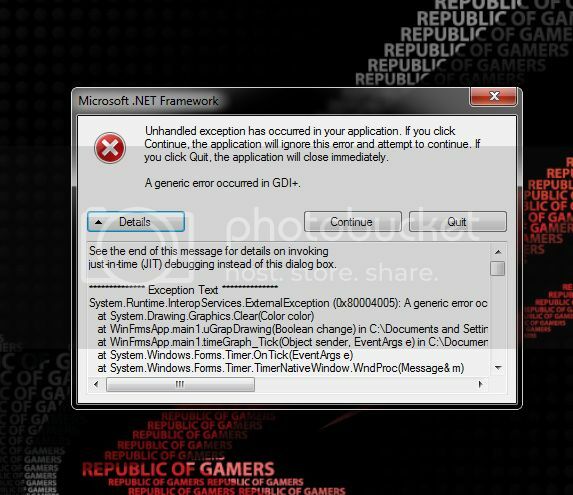 Haven't had the error message since this new beta, also I ran the .net installer tool and checked for .net updates and haven't gotten any errors since. Thanks Mike! Good to hear! Please keep us posted if other issues arise. My system is with a weird behavior. When I start the software, a red led on the board turns on. But, for each minute, the led turns off and the board beeps loudly until, after 5 seconds, the led turns on again. If I close the software, the led stays on for 20 seconds when turn off and the beep starts. If I start the software again, the system goes to the same behavior described before. If the board is beeping, a computer restart doesn´t stop the beep. In this case, only shuting down the computer stops the annoying beep. So, could you help me put the TMS system to run correctly? - Microsoft Standard Wireless Optical Mouse USB. same as the pic before, heres the copied code. Thanks Mike. Are the errors just as frequent after moving to 3.5.6? Are you on Windows 8 or 7? You uninstalled the old version before installing the new one first? You could try installing TMS on a new Windows installation. It's not ideal, but I'm guessing it would fix the error. We haven't seen this message from any other customers yet.